At last a film that grasps the nettle. There are plenty of challenging political thoughts and arguments in Hans Weingartner’s second feature film, and yet it is nuanced, humorous and has a superb lightness of touch. The Edukators depicts a rite of passage, love story and history lesson all rolled into one. Looking deeper into the director and actors’ own lives and experiences, it can be viewed as symbolic of post-1989 Germany. After the fall of the Wall, youths from east and west Germany moved into empty buildings in East Berlin as rents skyrocketed. A Squatters’ Council was formed representing more than 120 squatted buildings. During the 1990s, squatters and police were at loggerheads as the youth were cleared out of one building after the other. The film was shot 100% digitally with no artificial light. “The decision to shoot exclusively with hand-held cameras was important. We were able to explore the space and give actors licence to go wherever they wanted. We ended up with something very mobile, with cast and camera dancing around each other. Daniel Brühl who starred in Weingartner’s first feature film The White Sound, and has gone on to make Ladies in Lavender with Judi Dench and Maggie Smith, is the quiet but determined centre of the storm. Our view of Brühl’s character, Jan, is coloured by his role in the 2003 hit , Goodbye, Lenin! where he played a sympathetic son who wanted to make time stand still to keep his mother happy. Julia Jentsch, who plays the girl loved by two young men, trained at Berlin’s Ernst Busch Academy, the toughest and most prestigious theatre school in Germany, named after the singer and actor who worked with Eisler and Brecht. Croatian-born Stipe Erceg as Peter, the second in the trio of rebels, is totally convincing. 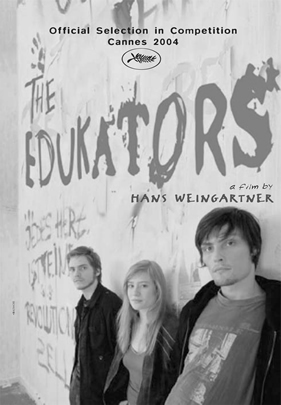 Like Goodbye, Lenin!, The Edukators expresses an intense desire for a different kind of world. But instead of recreating the past, it looks at the injustices of the present. Jan and Peter are political activists who seek to subvert the status quo. They break into the homes of the rich to “rearrange” their possessions, creating a chaotic kind of art form. The story is a denunciation of the inhumanity of corporate control and in Weingartner’s own words “an economic system in which human beings mean nothing and money is everything”. Jule, Peter’s girlfriend, has her own problems, and knows nothing about her boyfriend’s acts of “edukating”. She is weighed down by a huge insurance claim debt, keeping down her job as a waitress and paying the rent. Successful businessman, Hardenberg (Burghart Klaussner), whose villa is invaded by the Edukators, is himself an ex-1960s rebel. With shades of Joschka Fischer and other Sixties rebels who are now pillars of the system, he rationalises his political degeneration. He thaws out when forced to live cheek by jowl with the rebels, but is manipulative and perfidious to the core. As the story develops, the three young people are drawn deeper and deeper into defiance of the law. At the same time, their own friendship spins dangerously near destruction. The film deliberately flouts the gloomy view of relationships which Weingartner says dominates most German movies. In many ways The Edukators does not go beyond the realm of protest – and yet this makes it true to its subjects and its time. But the rebels have a vision and a loyalty to their ideals that show that another world is indeed possible. The film is an inspiring contribution to the current flowering of a new German language cinema.